Anyone heard of Old Souls Day in the Asian Culture? 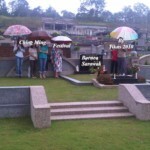 All Souls Day or Qing Ming (should not to be confused with the Roman Catholic “All Souls Day” (same name). Qing Ming Festival: Sometimes known as the Clear Bright Festival, Ancestors Day, Old Souls Day or Tomb Sweeping Day is a traditional Chinese festival on the 104th day after the winter solstice (or the 15th day from the Spring Equinox), usually occurring around April 5 of the Gregorian calendar. Qing Ming has been regularly observed as a statutory public holiday in Taiwan, Hong Kong and Macau. Qing Ming was reinstated as a public holiday in mainland China in 2008, after having been previously suppressed by the ruling Communist Party in 1949. I had the opportunity this trip to be with friends in Kuching in the island of Borneo. It was explained to me that the Qing Ming Festival is an opportunity for the families of the deceased to remember, honor and give thanks to their ancestors at grave sites. Prior to praying and offering food, tea, wine, they swept the tombs and cleaned the ‘houses of the ancestors’ ie grave sites/tombs before burning the joss paper and paper accessories at the grave sites. Those papers accessories are paper replica of some material good such car, maid, home, phone, and etc. In Chinese culture, even though a person died, he/she may still need all of these in the afterlife. 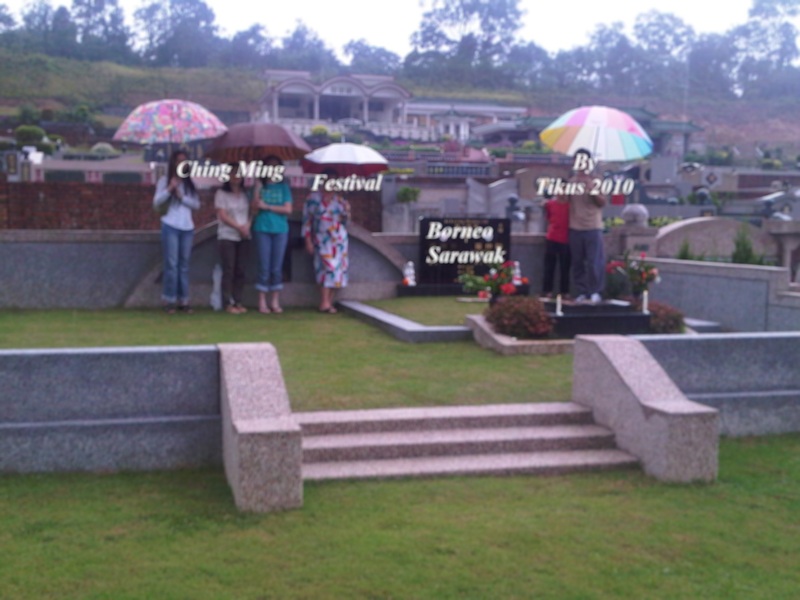 In Malaysia, the Chinese normally visit the graves of their late relations at the nearest weekend of the actual date. I noted that a week before the festivals, the grounds were burnt to get rid of the tall grass surrounding the graves. I suppose since the grave sites are only visited once a year during Qing Ming, one would then expect the graveyard to be clean only once a year. I noted that this is quite different to the more modern graveyard where expenses are paid for graveyards & sites to be kept in good conditions all through the life of the tenure. I visited the site of one grandparent and they are sites where a plot of land and the tombstone are the only expenses paid for the ancestors in those days. No continuous maintenance fees, thus not as flash as the new graveyards with maintenance fees. I was also told that there should always an even number of dishes put in front of the grave and a bowl of rice with incense stick upright. (Now I understand why I am not allowed to served a bowl of rice with my chopsticks standing upright in the rice bowl, as it resembles serving of ice for the deceased !) The rituals for praying are: family members take turn to bow before the tomb of the ancestors. Bowing will go in order, which starts with the most senior member of the family and so on. Traditionally, after the ancestor worship at the grave site, the whole family or the whole clan would be feasting the food and drinks they brought for the worship at a site nearby, signifying family reunion with the ancestors. However, I was told by this family that because everyone is time poor, nowadays people tend to just go home after praying, unless everyone had to travel very far to get to the gravesites eg from the town to countryside etc, then they tend to have their lunch together before heading home. These Qing Ming rituals have a long tradition especially among farmers in the rural farming areas especially in China. I read that some people carry willow branches with them on Qing Ming, or put willow branches on their gates and/or front doors. They believe that willow branches help ward off the evil spirit that wanders on Qing Ming. Also on Qing Ming people go on family outings, start the spring plowing, sing, and dance. You won’t associate Qing Ming as a time where young couples start courting but they apparently did in the olden days. Chinese of Christian faith tend not to follow the traditions of offering food and praying with joss sticks. They tend to bring flowers to the gravesite and say prayers without burning paper, incense. When I went to visit one of the grave sites, I asked about the solitary temple at the graveyard. I was informed by the caretaker that Qing Ming in Malaysia for all overseas Chinese is a family obligation. They have an elaborate family function or a clan feast (usually organized by the respective clan association) to commemorate and honor their late relations at grave site and their distant ancestry of China at home altar, clan temple or a makeshift altar in a Buddhist or Taoist temple.